Kaitlyn has the deepest blue eyes. 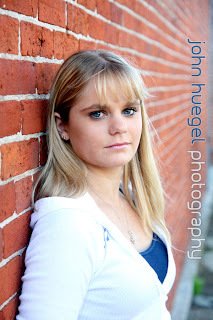 This image highlights her eyes in a close-up set by a red brick wall. The rain gods looked favorably upon us this evening. We hit the road and visited many outdoor places in Erie. Some were a first for any of our seniors, and some were favorites of mine. We finished outdoors at the beach and captured some great sunset photos. Then we took some more images indoors with a variety of backdrops and outfit changes.